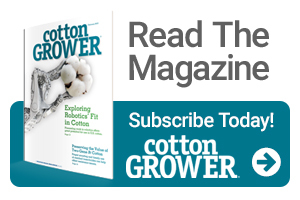 Due to persistent rains in November and December, many cotton producers were unable to get in the field to pick their crops. As a result, there is still between 5-10% left to be harvested, said Whitaker. In early January, between 10-15% of the crop was still in the field, but fields started to dry out and growers were able to resume harvesting. Prior to the storm’s arrival on October 10, the U.S. Department of Agriculture estimated that only 12% of Georgia’s crop had been harvested. Some harvested cotton modules were damaged by wind and rain from the hurricane.